Theresa May has negotiated the worst deal in history and Parliament is set to debate this terrible Brexit con over the next few weeks. 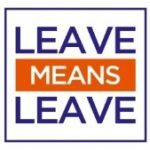 As an organisation, Leave Means Leave speaks out for those who voted to leave the EU in the 2016 referendum and we are very clear that this deal does not meet the expectations of the millions of people who backed Brexit. As such we want to ensure MPs hear our voices as they debate and decide how to vote. Beginning on the 3rd of December, and continuing until the deal is voted on, we will be holding daily protests outside Parliament every day that MPs are sitting. Starting at 11 am every day we are asking that people join us at the statue of George V on Abingdon Street for a protest against May and the worst deal in history. We need as many people as possible to join us every day we are out protesting so that this betrayal of your vote does not go unnoticed. Please sign up for a free ticket on our Eventbrite pages for all the days that you can attend. Register here if you can attend on Monday 3rd. Register here if you can attend on Tuesday 4th. Register here if you can attend on Wednesday 5th. Register here if you can attend on Thursday 6th. Register here if you can attend on Monday 10th. Register here if you can attend on Tuesday 11th. Please also forward this email to as many Brexiteers as you know to ensure a good turnout. Thank you for all your help – together we must stand up for our country’s future. Why Has Our Nation Offended Mr Trump? This week, we have seen something that I believe is another step closer to the second coming of the Lord Jesus Christ. We have seen the forces of darkness come out on the streets of the capital of this nation, London, led by a man I believe to be totally anti-Christ, Sadiq Khan, Lord Mayor of London, who many across this nation believe is not fit for office. If you do your own search, you will find out the organisation that led the protest against the most powerful leader in the western world is communist-backed. 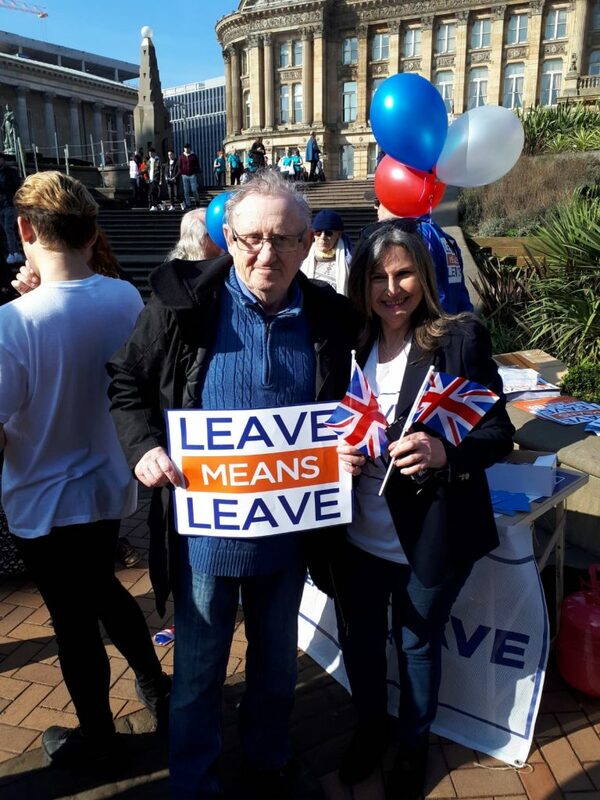 This was revealed on Piers Morgan’s programme Good Morning, Britain, as the leader of the protest was drawn out as Piers Morgan asked some fundamental questions, why were there not protests against the Chinese premier, the leader of Turkey and the Saudi king, and she could not answer. This just shows the pure hypocrisy of the communist left, whose aims are purely to put this country into chaos. If you looked at the TV coverage you will have seen that many of the people that marched were LGBT and those that are totally anti-Christ. 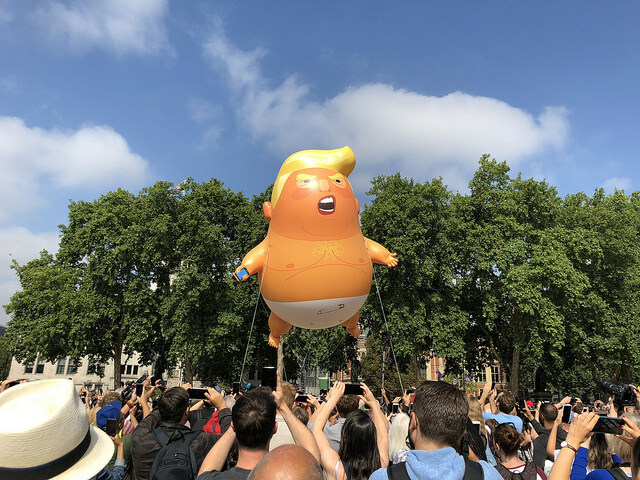 As for the abomination that was flown over London the other day, the blimp of President Trump, our Prime Minister and those in Parliament should hold their heads in shame. This is much of what the Bible says: in the end times there will be eating, drinking and feasting and Jesus will come back like a thief in the night. My brothers and sisters, I believe it is your duty to write to your MPs, also write to the BBC and the media channels and also to OFCOM, informing them of your total disgust at the coverage and also the biased nature of the media, as many organisations have tried to counter this garbage and it is clear who controls the media: the globalists. There is a counter-protest that will be taking place soon, which has raised over £50,000 to build a blimp of Sadiq Khan, which is at the moment applying for permission to fly over London. It will be interesting to see if Sadiq Khan authorises this, but I would not hold my breath, as many of the politicians of this nation have no moral fabric and no moral compass. It is time we the body of Christ got on our knees and prayed for our nation. Since Brexit, this nation has been split. I personally believe that it is God’s will that we come out of Europe and that we stand alone and trust in God. For hundreds of years, God has never let down this nation. I believe it is the body of Christ’s responsibility to get on our knees and seek our God to bring this nation back to Him. I would that the leaders of the body of Christ would seek God again as they did in the past. It also tells us in the scriptures that in the end times people will be lovers of self and I see much of this in the modern church today. The only purpose I have ever seen for the church is Matthew 28: 19, “Go therefore and make disciples of all the nations, baptising them in the name of the Father and the Son and the Holy Spirit, teaching them to observe all that I commanded you.” This is the command of our Lord and the purpose of the church. I hope like me you are praying for this nation that we shall come back to God again. If you have any views on this please do not hesitate to add your comments. It is time that the Christians of this nation started to debate the truth. There is no excuse for being silent, as Jesus told us that everyone who confesses Him before men, He will also confess him before His Father who is in heaven, but whoever denies Him before men, He will also deny him before His Father who is in heaven (Matthew 10: 32-33).